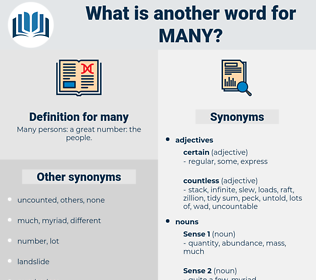 What is another word for many? Many persons: a great number: the people. a load of/loads of something. 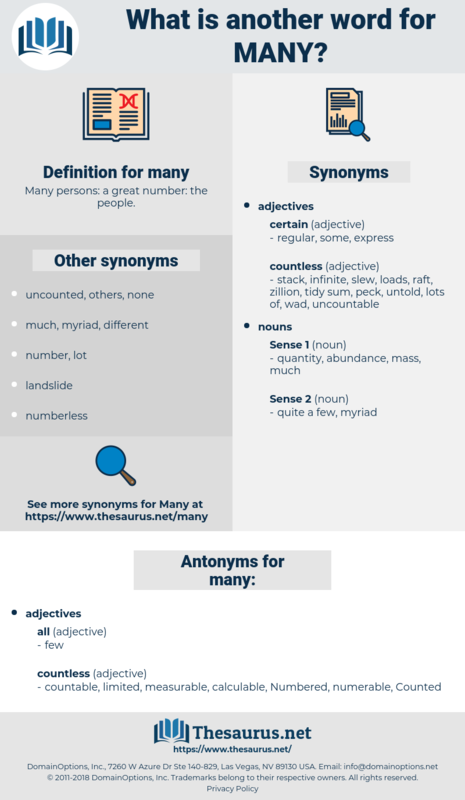 considerably, significantly, lot, plenty, substantially, often. innumerable, countless, manifold, ample, substantial, frequent, plenty. countable, limited, measurable, calculable, Numbered, numerable, Counted. same, standard, normal, uniform, similar. inconstant, irregular, sporadic, unrepeated, rare, unusual, infrequent, occasional, uncommon. lone, single, alone, singular, simple. a few, a couple of. You speak as if he had as many as I! It's one too many for me. man, mn, me, mean, meany, maoi, moa, mayan, mao, mummy, mane, memo, myna, many a, menuhin, minah, mini, maine, mammee, Minyan, maui, mannheim, Moonie, mi, M, maim, monomania, myoma, mahayana, ma, mon, maya, mime, miaou, mono, manna, moynihan, mona, moon, mamo, manama, mann, mei, mayhaw, maia, menominee, mew, mammea, mien, mom, m-1, mown, minim, mayo, minoan, mooneye, moo, min, mayhem, mamey, maha, moan, monoamine, mm, mem, menu, ma'am, moneyman, moue, minion, mine, men, Moho, miami, mo, mu, momma, money, many an, main, minnow, M.M., mina, meow, mum, mommy, m2, mym, m3, mahan, manannan, maw, miao, mynah, meanie, minimum, mahonia, mow, miaow, may 24, mahoe, minium, mamma, m1, mya, muon, mnium, menomini, moony, meme, mammy, mam, may, moon on, muumuu, mahimahi, mama, mania, mammon, mimeo, may wine, mho, mayenne, 8 May 1945, may 1.